Here is an excellent talk by Eugenie Scott of the National Center for Science Education (NCSE). Some of the things in here are specific for the American context, but it still provides a nice overview of evolution. 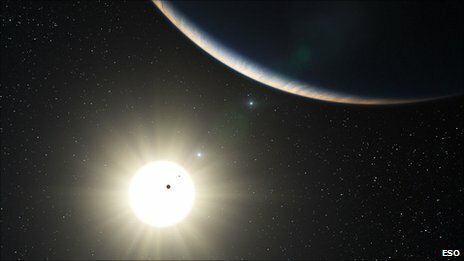 Perhaps, most importantly, it highlights the way debates within the scientific community often get misrepresented in the media. Check it out - it is about an hour long. "That is one of the more dangerous realities of how conservative evangelicals abroad can shape the perception of the West," she says. "This is especially sensitive in the Muslim world. ... [And then we see] this kind of defensive posturing of Islam — that Islam is under threat by the West. Unfortunately, a handful of evangelicals can misrepresent what the West is about and make Muslims feel very much under threat." Ideological conflicts like these are not limited to Sudan, but many of them take place along the 10th parallel, the line of latitude 700 miles north of the equator. More than 60 percent of the world's 2 billion Christians live along the 10th parallel — along with half the world's 1.3 billion Muslim population. Griswold spent the past seven years traveling along the latitude line and researching the places — like Sudan, Nigeria, Indonesia, Malaysia, and the Philippines — where Christianity and Islam collide. In Indonesia, home to the world’s largest Muslim population, the religious ferment mostly occurs between conservative and moderate Islam. Bouts of violence shocked the quiescent majority into defending a traditionally tranquil version of its faith and, happily, the moderates may now have the upper hand. Griswold trekked from Jakarta to the province of Aceh, meeting all sorts of Indonesians, from a terrorist leader to a bride-to-be worried she would be found not to be a virgin. Those unfamiliar with Asia may be surprised to learn that a much more draconian legal system defends and promotes Islam in tiny, prosperous Malaysia, whose oil wealth and skyscrapers coexist with measures that ban usury and ensure compliance with Shariah or Islamic law; make it illegal for a Muslim to leave the faith and forbid proselytizing by other religions — all to preserve the Malay culture and Muslim religion in this melting pot of Hindus, Buddhists, Christians and aboriginal tribes like the Orang Asli, who practice animism. 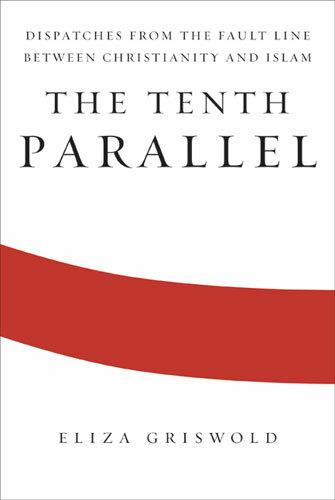 The same might be said of the itinerant and intrepid author, who candidly admits that she has discovered no neat theory to explain why people fight over religion or why someone like the self-proclaimed Reverend Abdu, a former Muslim Fulani nomad, lives his life as an unpaid proselytizer or why a missionary couple in the Sudan persist although they have not converted a single soul. Sitting in Abdu’s sweltering hut one day Griswold experienced the paradoxically cooling effect of the hot tea he serves her and realizes that some mysteries cannot be solved. The political motivations are quite obvious and it is almost funny to watch it alongside the Islamic Center controversy in NYC (and no, you still cannot defend the idiotic political opposition to the Islamic Center). While the first part of the video is good in highlighting this particular controversy, I think the interviews in the second part are more instructive in showing the struggle taking place within Islam in Malaysia (and similar debates elsewhere). One of the key points raised by the host (who did a nice job in keeping the discussion on track) is the notion of private versus state-enforced religion. This issue is not limited to Malaysia - but it takes a particular political turn there because of the presence of sizable non-Muslim minorities. Not surprising at all, but another thing to note is the significantly different interpretations of Islam by the three guests - all the way from a fatwa-driven society to the notion of religion as a private matter. Similarly, it was interesting to note the mention of the differences of interpretation of Islam in Malaysia versus in places like Saudi Arabia or the rest of the Middle East. And I also loved the fact that one of the guests, Yusri Mohamad, expressing displeasure over mixing religion and politics - despite of him doing just that in the whole interview. In many ways, Malaysia has done quite well in the last few decades. It is possible that the challenges it is facing these days are the result of these changes - perhaps the last hurrah of those against modernization and religious pluralism. But how it deals with its religious and ethnic minorities now may shape the direction of its future. The results of the 2008 elections ramped up the tension. The ruling coalition still won, but with a much reduced majority in the worst result in 50 years. Norani Othman, a professor at the Institute of Malaysian and International Studies (IKMAS) at Universiti Kebangsaan Malaysia, says that after independence, there was a national emphasis on consensus-building and equality. That was adapted, after race riots in 1969, to more overtly pro-Malay policies. As Muslim nations around the world struggled to modernise, yet not lose touch with their traditional roots, the influence of Islamist parties expanded. In Malaysia, that pitted the ruling United National Malays Organisation (Umno) against the Islamic Party of Malaysia (PAS) with the result that the 1980s saw a deliberate process of Islamisation. What were once affirmative action policies geared to help Malays "catch up" with other Malaysians became policies enshrining Malay primacy or ascendancy, and being Malay meant being Muslim. Institutions deemed to conform with Islamic principles and values were created - Islamic banks, Islamic insurance, Islamic university - there was even talk of "Islamising knowledge". The list of matters judged to be under the jurisdiction of Islamic laws has expanded over the decades. Just as the so-called race riots of 1969 were in fact a sign of systemic breakdown, as Australian academic Clive Kessler argues, so do the current tensions pose a direct challenge to Malaysia's founding aspirations of a diverse and democratic nation, argues Prof Othman. Let’s continue a bit with themes related to Ramadan (at least partially). The month is almost half over, and we are now well settled into a different lifestyle, especially with regard to eating habits. Our intakes (types and rhythms) have changed; our metabolisms have changed. In particular, consumption of meats and sweets has increased, at least in the places I am familiar with. Recently, in Jordan and in Egypt, advocates of vegetarianism participated in consciousness-raising events organized by the global animal rights group People for the Ethical Treatment of Animals (PETA). In the Amman, Jordan event, one lady covered herself with lettuce leafs and marched with others (see the accompanying picture, where the sign reads “'Let vegetarianism grow on you” – literally). Most interestingly to me is the fact that the lettuce-clad lady wears the hijab (the Islamic hair-covering dressing style). 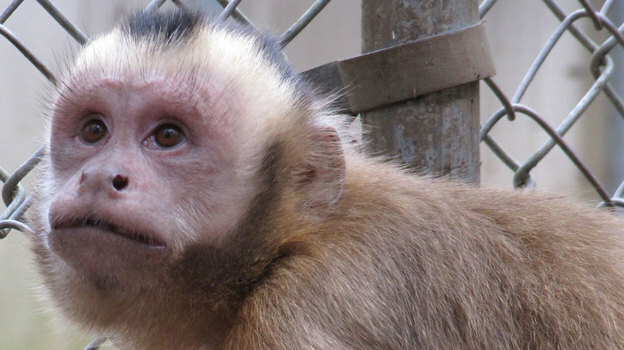 Although the activists tried to emphasize environmental and economic concerns and animal treatment issues, not to mention the presumably healthier aspects of vegetarianism, the general reactions to the PETA events were quite negative in both Amman and Cairo. The Arab world, it seems, is not quite mentally ready to embrace vegetarianism, and again we find religion to some extent related to this. First of all, it should be clear that one should not think that it is better to abstain from eating meat, that doing so will be rewarded, or that being a vegetarian is closer to Allah than not, and so on. It is not permitted to draw closer to Allah in this way. Muslim advocates of a more vegetarian lifestyle insist that the issue is not a religious one and that it is a serious mistake to discuss it in terms of halal (permissible) and haram (prohibited). They further claim that Prophet Muhammad himself preferred vegetables and only rarely ate meat and that some of the great figures of Islamic history, particularly Sufis/mystics like Rabi`ah al-`Adawiyyah, were vegetarians. Perhaps a compromise of moderation could satisfy everyone, or at least most people, from all perspectives: health, economics, environment, animal treatment, etc. And in the Ramadan spirit of remembering the poor and feeling their hunger and their needs, perhaps some of us should make a conscious effort to reduce our daily consumption of meat to a minimum and donate the difference. Couple of more thoughts on my recent trip to Malaysia (I still to post some pictures of a fantastic aquarium in Kuala Lumpur). 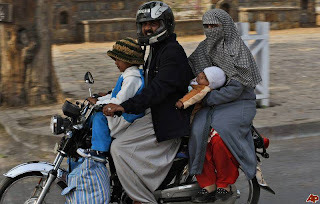 I was struck by the fact that I did not see anyone without a helmet on a motorcycle in Kuala Lumpur. Here is a picture at a random traffic light. I tried hard to find counter-evidence - but did not find one, either on the highway or on the bust streets of downtown Kuala Lumpur. I don't know. It is quite possible that helmets do not symbolize anything. But it appears that Malaysia is at an interesting transitionary point. It is certainly more developed than much of the developing world - and, at least Kuala Lumpur, is modern and pluralistic. Yes, there are more conservative, rural areas as well - but my views are based only on comparing urban centers. At the same time, there definitely appear to be tensions between the three dominant ethnic groups - the Malays (also all Muslims), the Chinese and the Indians. While I was there, everyday the newspaper headlines dealt with some aspect of this ethnic-identity debate. The future of Malaysia is definitely tied to how this multiethnic identity is resolved. Malaysia is justly proud of its record in managing what at one time threatened to be a conflict-ridden transition. It also takes pride in its distinctive Muslim culture and in the way its religious and ethnic diversity works in a fast-changing society. But behind Malaysia's new prosperity, seen in glittering skyscrapers and tangles of freeways, there are lively debates about what lies ahead. Malaysia's challenges involve above all its diverse ethnic, religious and economic identities, and today's debates turn on how the three are intertwined. By constitution, Malaysia is a Muslim nation and its population is majority Muslim. Malays and Islam are tightly linked. That translates, among other things, into legal tussles over whether one can renounce being a Muslim. Malaysians are trying to identify how the country's Islamic identity is distinct and how much latitude there is for different strands of Islamic thinking; how much can Malaysian Islam change as the country modernizes? The country's minorities are largely Chinese and Indian, and they are mostly Buddhists and Christians. How do their rights balance with those of the Malay and Muslim majority, in law and in the society? Thoughtful Malaysians worry that Malaysia's successful diversity is being challenged by an increasing de facto segregation in schools and neighborhoods. If the foundation of national identity is indeed that people of different races and religions will live and work together, they need at the very least to know one another. More integrated schools and curricula that highlight Malaysia's multiethnic and multireligious heritage and character are seen as the keys. Malaysia's lively debates about cool imams, how to curb child marriage, and what should be taught in schools are healthy symptoms of a complex society confronting the complicated realities of racial and religious identities in modern times. South Africa found much to learn from Malaysia when it looked east two decades ago. The lessons continue to this day. Step aside Lourdes. Here comes the festival of the Madonna of the Bikers. 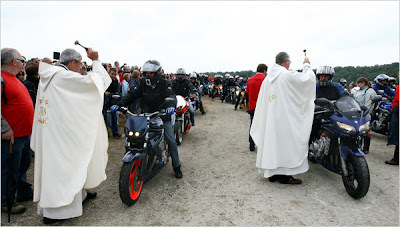 The festival of the Madonna of the Bikers, which organizers promote as the largest motorcycle “pilgrimage” in France — there are few aspirants to the title — attracted nearly 10,000 motorcyclists from across Europe last weekend to the soggy wheat fields of Porcaro, population 650. It was an unlikely mix of what Roman Catholic Bretons call the “sacred and profane”; many came to pray, many to carouse, a surprising number to do both. There were priests and incense and holy water and much solemnity and prayer, but also AC/DC and studded leather, body piercings and tattoos and, beginning well before noon and lasting well into the night, the consumption of prodigious quantities of alcohol. Despite all the imbibing, the gathering in Porcaro began as and remains a religious event, with the backing of the Catholic Church. If you are looking for ways to help Pakistan flood victims, please visit this post. 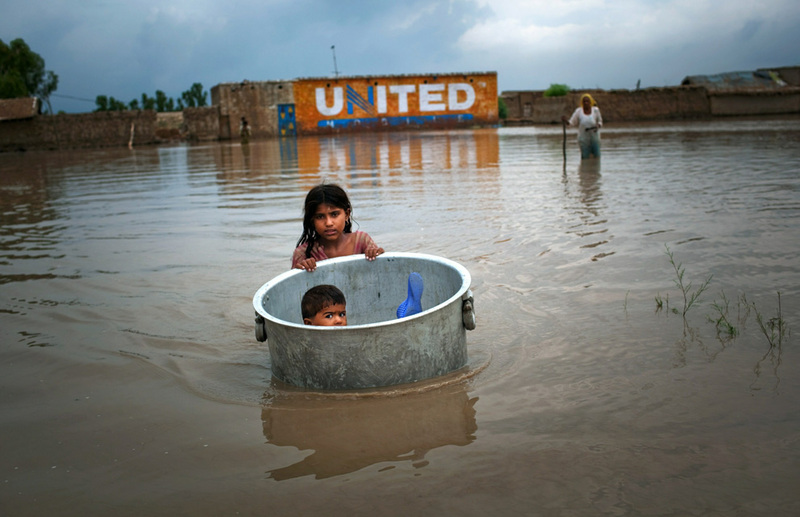 About 7 or 8 years ago, Science had published an article that talked about the coming water crisis in South Asia and its potential consequences for Pakistan-India relations. 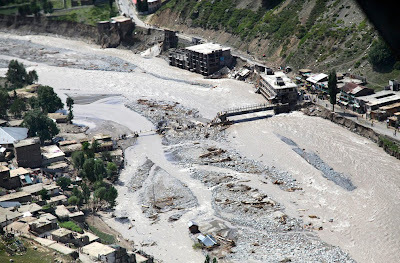 Its prediction (and it was dire) was that first there will be floods due to melting glaciers and other climactic factors, and then there will be a prolong drought. The water crisis, of course, may put the two rival countries at the brink of war. 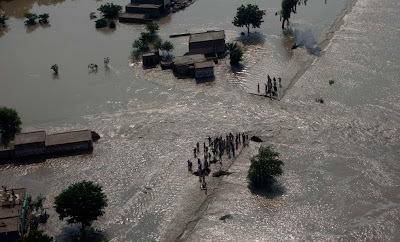 Here is a recent oped that talks about this flood & drought situation in South Asia and what can we expect in the near future. With changing climate, unfortunately, we are going to see more and more calamities affecting large and small populations across the globe. 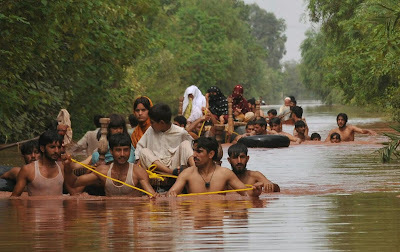 As for the current flood in Pakistan, read this excellent article by writer Daniyal Mueenuddin: A Lifetime, Washed Away (I will also have an excerpt from it below a photograph). A town in the northwestern region of Pakistan. No - this is not a stunt. This truck, with all these people, is really trying to cross these waters. Another picture from the Nowshera district. 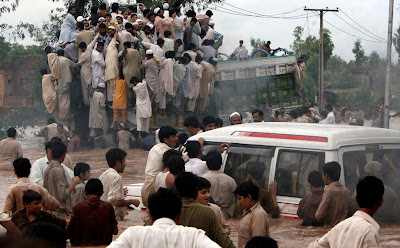 Notice the waist-deep water where everyone is standing. I have no idea, how that truck in the background is going to make even a mile. This is an effective rescue by a sister of her younger brother near Sukkur, in the southern province of Sindh. This is near Taunsa barrage in Punjab province. 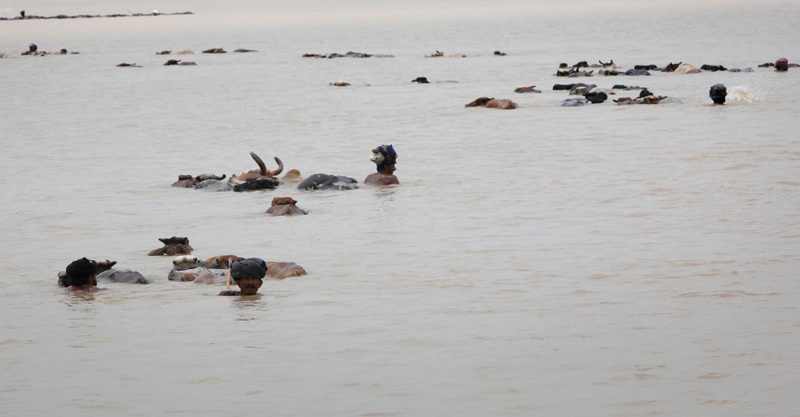 Here villagers are wading through floodwaters with their livestock. For many, this is the only thing they are left with. 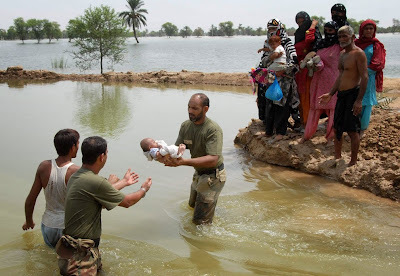 This picture is from the Sukkur district in Sindh province. This last picture provides me with an opportunity to post an excerpt from Daniyal Mueenuddin's article. Many of the displaced people had left the area in the past few days, driving whatever was left of their herds, carrying whatever they were able to rescue. I found most pitiful a family gathered around a prostrate brown-and-white brindled cow. The father told me that the cow had been lost in the water for four days, and the previous night it had clambered up on another section of the levee, a mile away. The people of this area recognize their cattle as easily as you or I recognize a cousin or neighbor — they sleep with their animals around them at night, and graze them all day; their animals are born and die near them. Someone passing by told the family that their cow had been found, and the father went and got it and led it to their little encampment. In the early morning the cow had collapsed, and I could see it would soon be dead. Its eyes were beginning to dull, as the owner squatted next to it, sprinkling water into its mouth, as if it were possible to revive it. Its legs were swollen from standing in water, and its chest and torso were covered with deep cuts and scrapes, sheets of raw flesh where branches rushing past must have hit it. The rest of the family sat nearby on a string bed, resigned, waiting for the end. This was their wealth, but when it died they would tip it into the water and let it float away to the south. Through the past few days they had seen it all, houses collapsed, trees uprooted, grain spoiled, and this was just one more blow. Read the full article here. If you are looking for ways to help flood victims, you can find a list of organizations here. 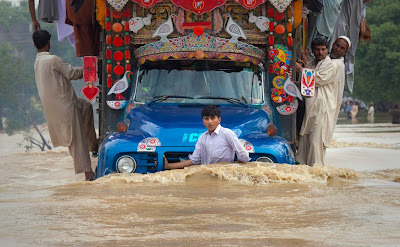 Excellent blog, All Things Pakistan, has compiled a list of agencies that are helping flood victims in Pakistan. I have reproduced that list below. It is still hard to imagine the fact that 20% of Pakistan - about the size of all of England - is under water, and that 20 million people, out of a population of 170 million, have been affected. Please pick whichever organization you like and help whatever you can. Thanks! I am highly interested in the interplay between Religions (beliefs and behaviors) and Technology (old and new). A few months ago I had a piece titled “Islam and Technology (ringtones and Facebook)” in which I discussed some new situations where mobile phone and internet technology were affecting Muslims’ lives, willingly or unwillingly. And two weeks ago I had piece I titled “Ramadan by CCD”, where I explained how the determination of the start of the holy month has been seriously affected by modern astronomy, its science and technologies (telescopes and CCD imaging techniques), which has created a stronger tug-of-war between the traditional ulemas and Muslim modernists. But the most striking and novel technological interfacing with Ramadan and Islam this year especially has been the suite of apps (applications) that have been developed for mobile phone, particularly for Apple’s iPhone but also for other brands and models (Nokia, etc.). 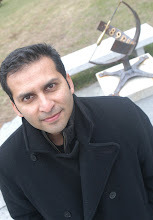 Programs like iPray, iQuran, and ‘Find Mecca’ have been very popular: the first one produces calls for the five daily prayers for any location on earth; the second allows the user to read or listen to the Qur’an and even keep track of how many pages one has read or listened to and which specific parts have been studied; the third one is an electronic compass-like indicator that finds the direction of Mecca for prayer from anywhere. But even such programs, though very popular, are simplistic in comparison with other ingenious apps that are available for download and usage (sometimes for free, but often for as little as 1 to 3 dollars, sometimes for more). Consider, for instance, programs that allow Muslims to find the nearest mosque in any city, especially useful when traveling to a new place, or a restaurant that serves halal (islamically prepared) food, or even the nearest Costco (large supermarket chain) that carries halal foods. Consider also apps that simulate the clicking sound of prayer beads or teach the correct pronunciation of Islamic words or phrases (for the recitation of the Qur’an or for performing the prayers, in Arabic). 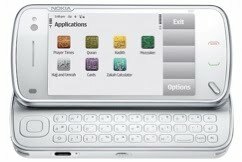 The iPhone is not the only device for which such apps have been developed. Nokia has a Ramadan suite for its mobile phones that cover many needs that a Muslim may have, during Ramadan in particular (e.g. “Essentials of Ramadan”, “Ramadan Daily Dua/Supplication”, and “Ramadan Booster Pro”, which offers “tips and recommended good deeds to help organise your Ramadan”) or for his/her religious life, more generally (tons of books, video tutorials, etc.). How are these apps, and this new high-tech transformation of Islamic life (at least for the savvy and the affluent) to be looked at and assessed? There is no doubt that these programs are useful for many Muslims, especially in cities and countries where, for example, prayer times are not readily known and no calls for prayer are broadcast from mosques. And many Muslims have expressed their happiness at the availability of such apps. On the other hand, there are two fears that one can have from such a development. First, the subtle pressure on Muslims everywhere to be more devout or at least more observant of the rules (as one user said, “you now have no excuse”). I have no objection whatsoever to seeing some people use tools that help them willingly be more devout, but I am fearful of social and peer pressure. Secondly, and perhaps more dangerously, at least potentially, there is a creeping commercialization of the religious life of people (Muslims and others). Just as Christmas has long lost (for the most part) its religious spirit and significance and is now a huge selling and consuming event in the west, one may fear something similar for Ramadan, where Muslims will buy, buy, buy and exchange gifts on this holy and very spiritual occasion. There are already “Ramadan festivals” everywhere, where companies offer discounts on anything from cars to furniture and people are encouraged to buy, consume, and eat. And I won’t even describe the frenzy that takes place during Eid (at the end of Ramadan). As Prashant Gulati, a Dubai-based investor who focuses on technology and media, put it: “there is market for high-tech Islam”.